The whole Ramen Keisuke line has been known to wow fans with their fantastic ramen options, and we can only be even more excited upon knowing that they have launched a 10th outlet in Clarke Quay – Ramen Keisuke Lobster King. This new concept sees Chef Keisuke Takeda going back to his French culinary roots, creating a unique Lobster Broth Ramen, which will be served exclusively at this new outlet. And for all supper goers, Ramen Keisuke Lobster King opens daily from 6pm all the way till 5am! He uses only premium French rock lobsters specially imported from France. The rock lobsters are first de-shelled, then the shell is pan-fried, crushed into fine bits and subsequently simmered for 6 hours with a special blend of herbs and vegetables to create a flavourful clear broth. If you pick the creamy broth version, look forward to an even more intense flavour for the whole simmering process takes an additional 4 to 6 hours. The menu will offer 4 different ramen options – Lobster Broth Ramen with Clear Soup (S$13.90), Lobster Broth Ramen with Rich Creamy Soup (S$14.90), Miso Lobster Broth Ramen (S$14.90) and Spicy Miso Lobster Broth Ramen ($15.90). And they are all served with super tender pork belly and chicken char siew, black pepper prawn wontons topped with crunchy bamboo shoots. 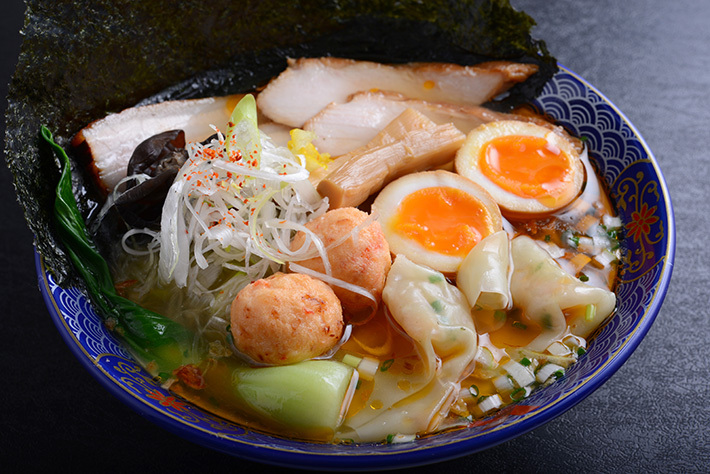 Other than just these 4 ramen options, you have a variety of side dishes to pick from. Some stand-outs are Beef Tataki (S$9.80), Pork Gyoza (S$8.80, 5 pieces) and Stir-Fried Mushrooms with Garlic Butter (S$8.80). You can now have an excellent post-night out dining option, right in the heart of Clarke Quay.